My good readers. We've been scammed, hoodwinked, and lied to. The USA you see today is not the USA of our founding. Neither are the problems most complained about today, caused by the system set up in our founding. What you see is nearly a hundred years of damage caused by a festering boil, a cancer caused by those that have the audacity to say they know better than you, progressives. The sad thing is, most of those proclaiming to be progressive do not understand what it really means. Unfortunately, many people pay attention to the word "progress" and naturally think that being "progressive" means you support progress. How convenient to have a name and slogan that is so far from progress as Pluto is from Sol. Believe it or not, it's not an argument of Americanism versus Progressive. This is part of the scam. What so-called "progressivism" is, is really the age old European elitism that those that colonized this land fled from. It was the idea that a small intellectual elite knew better than the peasants or the masses on how to live their lives. Throughout the centuries, the "old world" was always governed by a small group of people. Europe had its monarchies where families were born into leadership (royalty) and they had their relatives, which were Dukes, Barons, etc. These people had the advantage of education by virtue of their unearned wealth. They always promised to "take care of" or "protect" the people. People thought that is how it was supposed to be. Why? Those in power liked their power and used the church to manipulate them. They would make claims that God had chosen them to be King, etc. The religion wasn't the problem, it was those that corrupted it and used it for their own uses. Asian and African rulers took this to the maximum. The emperors of Asia (even as recently as Japan in the mid 1900's) considered themselves divine, or demi-gods and the people did as well (or else). This control of knowledge and worship played a large part in the history of the world. This is the main reason why the world laid in stagnation for centuries. Those in charge used lies and free gifts to convince the people to fall in line. This illusion of the free gift became a well known and often used means of enslaving and ruling a people. There has been only rare cases where man actually progressed in knowledge and quality of life. Coincidentally, these occurrences happened when the individual was free to make their own choices in life and was free to profit off of their discoveries. Israel of old. Some people would say "No! They had kings!" and I would say you're right and wrong. Israel started as a free society with Moses being a chief judge the separate tribes would come to, to decide on difficult issues. They did, nevertheless, have a set of laws given through Moses on how to govern themselves. From Moses, to Joshua, all the way to Samuel, Israel is free and the people mediated by judges to decide arguments of law. During this time Israel became great, for the most part. It's when the people wanted kings that Israel started its downfall. For those of you "progressives" that try to convince people that socialism (or big government control) is of God, obviously have chosen to ignore "1 Samuel 6" and Samuel's great warning to the people if they chose to have others rule over them. Then there's the grand idea of the Greeks and the first attempt at a representative republic. It was the Greeks that gave us many of the ancient wonders of the world, if I'm not mistaken. It was also when people had the freedom to think, discover, and experiment for themselves. People sold their ideas and became quite wealthy. The society fell apart when those in power, who were supposed to serve the people, found that they could stay in power by promising free gifts to the people and those that supported them. Pretty soon those gifts became expensive, and so did the greed of those remaining in charge. The once free system turned into an empirical system. The citizenry, having become used to government welfare collapsed the government by their greater and greater demands for support. Of course then there's the Roman Empire. Guess what, it wasn't an "empire" originally. It was a representative republic that built upon the strengths of the Greek experiment, and emphasized the individual freedom of the Roman citizen. The citizens would elect governors and senators to govern provinces and the nation. The nation grew rapidly because of its success. It wasn't perfect as you had to be a Roman citizen for the benefits of freedom. Nevertheless, great innovations and leaps of science occurred during this time. You had indoor plumbing, hot and cold water, the idea of hygiene, leisure time, more people being able to afford an education, and a general higher quality of life. However, people became complacent in their success and those in leadership positions either lazy or anxious to keep their now opulent lifestyle, started once again offering free gifts, handouts, social programs to the populace. People liked that, heck, it was "free" right? They got used to it, and the nation became weak. Pretty soon other nations coveted (really wanted) the riches they had. The great Roman army became forgotten and this a problem. So in the face of war, the people looked to a "saviour" to rescue Rome, and someone did, and turned the lax army into the greatest fighting force in centuries. When this hero returned, he demanded, as his reward, the position of "Emperor of Rome". The Senate and people didn't hesitate and made him absolute ruler. It actually did fine while he was alive. He had an ego, but was relatively fair in his rule. He just left most things to the Roman Senate and lived a life of opulence. Unfortunately, he reproduced and subsequent Caesars were the downfall of Rome. They became very greedy. They became the elite of Rome. Now the Roman citizen was considered a lower class than Caesar's house (royalty). They found easy ways to gain loyal followers out of the populace by government handouts and free gifts. The people expected more and more of the government's support, until it became mathematically impossible. Nobody was inventing anything anymore. The government taxed them to poverty. Why try to better yourself and society if Caesar just takes it away? For a short time the Anglo-Saxons had a judge system of government similar to early Israel, and the people prospered as well. However, monarchy rule dominated that experiment due to the need of a single nobleman and his ability to hire an army to protect a kingdom from marauder attacks. So, in the latter parts of the second millennium AD, people started becoming sick and tired of being told how to live their lives according to someone else's "expert" or "intellectual" opinion. America was a new land, pristine, not entrenched with the traditions and trappings of the old world. People didn't travel half way around the world on filthy boats because life was better in Europe. They wanted a better life, a life they chose how to live. Whether it be a religious choice or a business choice, it was their choice. d the best education, and it varied greatly. Seriously, they didn't have much else to do, so they studied books, ancient texts, history, science, etc. They were free to experiment and trade. Those in Europe saw an opportunity to take advantage of this wealth of information and resources. What was unique about this is new generations of Americans were born without the trappings of the traditions of the old world. The idea of property and working hard for a living and earning just payment was the norm. The idea that someone across the world had the authority to tax your hard work for things you had nothing to do with, really chapped their hide. They turned to the pillars of their society, their fellow citizens and businessmen, as well as the common farmer and rancher. The best of these gathered together and tried to come up with a peaceful means of fixing the problem. What they got was a condescending government elite that insisted they knew better and had the intelligence and right to treat those in America the way they were treating them. England's King George had the finest education, the best tutors, the best money could buy, yet he didn't have a clue about his own subjects and their needs in England, let alone the colonies in America. He turned out to be the smartest idiot in the 18th century. Our founding fathers, many of them were scholars of history, religion, and governments. They knew about what systems worked and what didn't work. They understood the weaknesses of mankind and their imperfections. They also appreciated and understood the freedoms granted to all men by "nature's God". They understood the grand mystery. They understood that the only way that society can truly benefit is when the individual is most free to live in it. They learned from their studies that when a group of "elites" make decisions it is always flawed and designed to benefit themselves and not society. They learned that the cry "for the good of the people" meant that the people were about to get shafted. It is this understanding that society benefits from the free individual living in it, and not society that ignores the individual. Their experiment proved that this representative form of government, a republic, was best to protect the individual and thus society, if the government was limited in its power. Thus the US Constitution was written. After a miraculous victory over the world's best army and navy, this nation began to blossom. Everyone knew that you had to earn your living, and that those that could not, needed compassion from those that had. The USA grew very fast, and grew very powerful in a short period of time. It was a manufacturer of nearly everything that changed the world. All of the good ideas and products came from the USA. These advances also allowed a lot of leisure time and travel. Now it was possible to travel to Europe and back in a short time. Unfortunately, this is also the time "progressivism" infected our society. The old ways of Europe were taught as if they were new ways. The ideas that people could be bread, the "inferior" races could be bread out like cattle, were all European ideas, originally. You had a growing group of elites that thought themselves more qualified to lead the nation and guide it to a glorious perfected Utopia. They insisted that people could be "trained" to eliminate bad habits, "conditioned" to serve the community. They started convincing people they were better than the Jews and other minorities. They had many convinced that the community came first above the individual. They blamed the problems of society on these groups. They set class against class, race against race, and made the case that in order for "fairness" there must be "social justice" and that spreading the wealth was the way to solve poverty. Unfortunately, nobody had a historical memory. The "solutions" the progressives spouted were the very causes of societies problems and that centuries and centuries of historical proof was there to make that case. Thou shalt not bear false witness. You have to lie to people to be convincing. I am the Lord thy God… Thou shalt have no other gods before me. God is replaced with other treasures, what the other guy has and the idea that you are entitled to it because you covet it. Six days thou shalt labor and do all thy work… Convince enough people that government is supposed to take care of them, and then you have them enslaved for life. Honor thy Father and thy Mother… Since the parents had life experience and knew the mistakes of the past, what better way to enslave the new generation than to convince them their parents don't know anything. It's the lie of "we are helping the poor" that ensnares the potential progressive inductee. However, pay attention to history. FDR's "progressive" economic policies turned an ordinary cyclical depression into the "Great Depression". The only thing that saved us there was a world war! Many of FDR's unsustainable programs are now coming to the point that they cannot possibly be sustained. Social Security, the grandest of Panzi schemes, has reached its unpayable point to where it now costs more money to pay out than it takes in. Medicare and Medicaid, the first government health care programs, are also on the verge of collapse. Progressives found out from Stalin, Mussolini, and Hitler, than the best way to control the populace was to control its means of getting health care, and the major lending and utility industries. When Americans finally saw the Progressives for who they truly were, they left them like rats escaping a sinking ship, and progressives went underground and changed their name to a less threatening "liberal". Once again changing the meaning of a good word to fit their goals. What is it the progressives constantly try to suppress and hide or lie about society? The rights of men and women come from nature or nature's God. This is something man will always crave and want, and that's individual freedom to choose. It's in their DNA. It cannot be "bread" out of people. It is part of their instincts. Progressives try to convince people that the "wise" government graciously gives you rights. A free people breads a free market that is not evil nor greedy. Greed is individual and not part of a system of economy. This freedom to profit and innovate brings great discovery as the need to fill a need is a great incentive innovate. This has the side effect of benefiting society by the introduction of the innovation into society. After corrupting the market with government restrictions and social entitlements, Progressives try to blame the economic failures on "capitalistic greed". Freedom of speech is a right given to all, both atheist and religious, left and right, government loving and government hating, racist and non-racist. The progressive wants to silence contrary discussion all for the sake of "fairness", but in reality, to shut up the opposition and those exposing progressives for the lies they tell. Progressives label all contrary discussion as "hateful", "racist", "stupid", "unamerican", or even "terrorist" speech. If you cannot offer a valid argument, then use the politics of hate and envy to shut up the opposition is the Progressive mantra. Religion is private and individual. God is universal. Government cannot tell you how to worship. This doesn't mean government denies the existence of God or at least the divine. Progressives want to use religion to control the people by placing the government as the God sanctioned participator in salvation. Progressives tend to feel themselves superior to the masses and they are "intellectuals". They studied at the finest ivy league schools and learned from the best thinkers this side of the Atlantic. The problem with this arrogant belief is that history has proven them wrong time and time again, but they insist THEY can do it right this time. Ordinary people call this "insanity". None of these people have ever lived in the real world. Their world is the land of theory and make-believe where everything fits into an equation and society is a constant. None have tried to run a business, keep a payroll, make a rent payment, paid a mortgage, or shopped in a grocery store, nor even been inside a (gasp!) Walmart. They have become the most intellectual people without a clue. The smartest idiots in the world. Have you ever wondered why Progressives do not practice what they preach? Why is Oprah living in a multi-million dollar home instead of giving her excess to the poor? Why is Bill Maher able to tell everyone how stupid they are and yet refuse to practice what he preaches by spreading his wealth around? Why are people like Timothy Guitner and Charlie Wrangle so willing to spread your wealth around but refuse to pay taxes like everyone else? Why is it James Cameron can belittle and put down those that are unwilling to carry the progressive mantra when he is living in the lap of luxury getting rich off of the very system he calls evil? Hey, how about spreading your wealth around instead of telling us we must spread around our miserable pittance! American charities have given more to charitable causes than all of the European governments (and the US government) COMBINED. This is a fact. It would seem that when people think the government will take care of things, they don't think they need to give. That government, on the other hand is already spending everything they have taken from the populace on domestic social programs. So… the third world can be happy knowing people are getting free condoms and health care in Europe. The USA, on the other hand gives more to causes per capita every single time a need arises. I feel obliged to withhold my approval of the plan as proposed by this bill, to indulge a benevolent and charitable sentiment through the appropriation of public funds for that purpose. erican people, they can do more than the government could ever hope to do. Those were the days when integrity meant something. Progressives have no integrity. Their policy to to do whatever it takes to achieve their goals. In other words, the ends justify any means. Whether it be by lying, stealing, cheating, slandering, whatever, if it promotes the common goal, then it's OK to the Progressives. This was something Saul Alinksy, their second favorite author, wrote about in "Rules For Radicals". Progressives are also very good at redefining words. The name "Progressive" says nothing about their true intentions. "Liberal" is also a redefined word. You'll find they are very good at the "twist the meaning" game. So-called "Political Correctness" is a progressive implemented practice. They will cry, "we aren't socialist, we're progressive", yet their very policies are none other than socialist. "Spreading the Wealth", "Workers of the World Unite", "Social Justice", "Fairness" etc. are all Socialist policies, yet they will insist they aren't Socialist. Next they will be trying to convince us "is" has different meaning … wait… never mind. Progressives have spent over a hundred years slowly implementing their plans. They have rewritten history, indoctrinated our children to not appreciate what they have and that freedom has been earned, not handed to them. They infiltrated the news agencies that now they are just propaganda manufacturers for Progressivism. It's all coming to a head, and Progressives, once again, can see their control a mere arms distance away. When the brass ring is within a finger's reach to them, nothing will stop them. You can see it in the daily news. You can see it in the blatent lies told by our leaders to achieve their goals. You can see it in the in-your-face disregard for the people our Congress shows on a regular basis now. For them there is no longer a need to be in the shadows. It has now turned into a real battle of good versus evil. Those of you that know me or have been reading my articles over the years know my choice of religion. I do not expect you to suddenly convert, you decide what is best for you, whatever that may be. Nevertheless, I need to explain my point of view in this matter. This battle of freedom versus government oppression is essentially the central theme of our purpose here in life, according to my beliefs. The idea you can force people to be "good" or charitable is an evil idea, the real purpose isn't goodness, it's control. We (those of my faith) believe Lucifer being the author of this lie and that through the centuries he has used it to bring power to some and misery to many throughout the world. Jesus came and showed the freedom to chose is the key to knowing good from evil. The key to understanding what misery is because you have felt joy, and that personal choices can bring either joy or misery. Freely giving not only blesses the life you are giving to, but also blesses you for making that choice. It brings you joy bringing joy to others. Forcing you to do so, eliminates joy and only breeds resentment and misery. When a good rich man asked Jesus what he must do to enter the kingdom of God, Jesus told him to sell all of his riches and give it to the poor and then come follow him. He did not say go and give your riches to the government, nor did he say the government should take them. He told the man he must choose to do this himself. He must freely choose to give to the poor. This was a lesson about charity. God knows what he is doing. It is why there is sadness in the world. It gives others a free choice to help those in misery and thus benefiting both with thankfulness and joy in the act of giving and receiving. The rebellion in heaven I believe many misunderstand, is this very same idea. God had a plan, to take a great risk by giving man the freedom to choose, thus allowing him to grow and to understand God and become better themselves. Because man was weak, he'd need a savior (Jesus) to satisfy the cold hands of justice with the warmth of mercy. Lucifer, being cunning and very influential, put forth a "better" idea. He said he'll guarantee everyone will return without the risks of some failing the other plan has due to freedom of choice. He'd force everyone to do good, and in doing so, he demanded the glory for doing it (like Caesar). Jesus said, "Father I'll do whatever you ask me". God said "we'll stick with my plan" and Lucifer, like a whiny baby got pissed and raised a ruckus, along with a lot of others. He was cast down to earth to await his punishment at the end of days, but in the mean time became Satan, bitter and angry with God and Jesus, and swore to do everything in his power to bring down all of God's children. So, when I say that socialism, communism, progressivism, whatever the name of the day, is the oldest argument in the world, I really do believe it. It doesn't work, and is designed to bring misery to everyone, it's only real goal is to give power to those wanting to impose it. God's plan of free choice is a risk, but the rewards far out weight the risk. In less than 200 years this nation with the idea of individual freedom, has brought the world out of perpetual squalor and poverty constantly pressed upon people for the want of power for thousands of years, thanks to Satan. So, is progressivism evil? Yes, I believe it is. Are all progressives evil? No, but I do believe they are being deceived by those that know it's evil and crave power. Evil has a way of counterfeiting good for its own purposes. It's very good at turning things on its head by making good look evil and peculiar, and making evil look good, normal, and desirable. One thing is for sure, like roaches, evil hates the light of truth. The scriptural phrase "wailing and gnashing of teeth" is quite literal when it comes to truth exposing evil for what it is and evil's reaction to it. How many accusations of "hate-monger", "racist", "terrorist", "Jesus Hater", "Poor Hater", etc. do you see in the news today for people or groups of people exposing the light of truth on progressive ideals? This spewing of accusations and lies is the "wailing and gnashing of teeth" read about so often in the scriptures. You can now see their attempts to convince people that these people are "dangerous". Yes, they are dangerous to those spreading lies, but they are not dangerous in the sense these propagandists are trying to paint them. The ones we should be listening to, the survivors of the last remaining of the last generation that survived tyranny of Stalin, Mussolini or even Hitler, are coming out warning people the same thing is happening now with our government. What is the response of the media? To belittle them, accuse them of hatred or racism, all because their life experience has taught them that the lies of socialism or "progressivism" bring only death and misery and do not deliver on it's Utopian promise. Stalin's "progressive" workers movement – 30 million deaths, most Ukrainian. So much for the "for the good of the people" lie. ost Jews. Karl Marx said 20% must of necessity be eliminated to have pure socialism and Communism. Fidel Castro and pal Che Guevara murdered many thousands (14,000+) because they refused to give up their individual human rights or land. Che wrote in his own journals about his sadistic enjoyment of pulling the trigger himself. China's Mao Tse Tung starves 70 million (to death) of his own people for the sake of a failed social experiment. Surely Karl Marx was right and these people dying just did not understand this intellectual. Hugo Chavez, the Hollywood elite favorite. This grand example of socialism, must tell people to take two minute showers in a land of multiple inches of rain every year (tropical), has power outages daily, and yet supplies oil to many nations of the world. Plenty of oil to generate power. Jails anyone for speaking against Chavez, the "glorious leader" everyone must listen to for hours on end (so much for broadcast "fairness") every week espousing the "virtues" of socialism, while his nation lives in fear, is smelly due to lack of showers, is in the dark due to poor energy management, and has instituted a "fairness" policy in the nation's TV and radio stations. In other words, if it's not pro-socialism, it's not fair and thus not allowed. Oh let's not forget the many political prisoners (about 6000 of them) he has caused to be put in jail for daring to claim socialism is a lie. My friends, read the Constitution. Seriously, read it. Challenge yourself to spot the fantasy "right to abortion", or "separation of church and state" or if the Federal government has the authority to impose a public health insurance program. You won't find it. These are lies perpetuated by progressives. 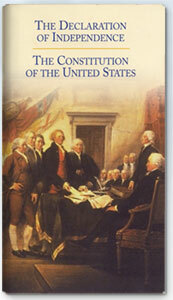 The US Constitution was written for all to understand, not just judges or attorneys. This is simply because it is a government by the people and for the people, not the elite. Learn something, read the Declaration of Independence and the US Constitution and see what you have lost to progressivism. It's free from the Heritage Foundation. I honestly believe God inspired these men to write these documents, and that the ideas and truths in them never change, but remain unalienable and constant. Conservative News: Coulter – Wouldn’t A Mini Series on Attila the Hun Explain Nancy Pelosi? I’m actually very surprised, given your initial front, how quickly and totally you’ve collapsed. A couple of very mild challenges to your unsupported rhetoric and you’ve retreated behind the standard shield mechanism of logical fallacy. You have absolutely no intention of responding to a genuine challenge to your opinions, do you? Are you indeed, even capable? So, do you intend to engage at any stage, at any level at all, or will you continue to simply carry on in the manner you claim to disdain? All you have done is talk trash up to this point. It’s obvious you have nothing to offer but trash. So I don’t think it worthwhile to fuel your endless pontifications of superiority without any substance behind them. For me, in this case, it’s like watching someone have a seizure. It’s all very entertaining in some sick way. It only affects you, as you can’t help yourself. Sure, there’s some screaming and moaning with a good deal of foaming at the mouth, but most people would rather it stop because you’re making a mess and you’re keeping them from more important things like insurance seminars. LOL…..and you haven’t talked ‘trash’????? You’re good, buddy, but not as a serious debater. Comedian would be more your style, but you’ll need to work on it. You go ahead and keep thinking that. I guess a “legend in his own mind” must do such things to keep the narcissistic illusion you have created for yourself. Your behavior has nothing to do with debate or rationally discussing differences of opinion. It’s all about you. Everything you do points to this. You cannot be wrong and will attack anyone you perceive as damaging your reality that you have created for yourself.So yes, I’m not going to play that game with a narcissist. Good bye. Say what you want about me. I could care less.